“[…] Journalist Rilwan, who is now dead, no doubt, a very regrettable matter,” President Abdulla Yameen said Tuesday, August 7. The callously offhand remark came during a tirade against allegations leveled by his jailed former deputy. The remark was met with shock across the country. It came less than an hour after the abducted Maldives Independent journalist’s family told the press of their intention to sue the police for negligence. Rilwan was abducted outside his home in the early hours of August 8 four years ago. The authorities have refused to say whether he is alive or feared dead. About an hour after his remarks were widely reported, Yameen apologized and insisted that he did not mean to declare the death of the missing journalist. He was trying to refute claims made by former vice president Ahmed Adeeb that Yameen had stopped a ministerial level inquiry into the abduction. This was the first time Yameen spoke publicly about Rilwan after he refused to comment on the abduction in 2014. Yameen’s remarks came days after the Criminal Court acquitted two suspects accused of abducting Rilwan. The president’s apparent Freudian slip together with the not guilty verdict have bolstered long-held suspicions about complicity at the highest levels of government. The Criminal Court verdict issued on August 2 blamed negligence by police and prosecutors as the court freed two suspects charged with terrorism over the abduction. The suspects, Alif Rauf and Mohamed Nooradeen, were accused of forcing Rilwan into a car at knife-point outside his apartment building in Hulhumalé on August 8, 2014. Both were arrested in April 2016, but freed two months later. They remained free during the trial, in stark contrast to other defendants charged with terrorism. Delivering the verdict, Judge Adam Arif reprimanded the police and prosecution for failure to conduct a thorough investigation into what he called a “dangerous atrocity that seemed to have been conducted by a network of several people.” The failure to answer basic questions showed negligence and carelessness by police investigators, he said. The outcome of the trial came as no surprise to family, colleagues and friends of Rilwan. Over the first two years since the abduction, the Maldives police adamantly refused to say it was an abduction. Police followed leads suggesting that Rilwan had run-away from home or left the country on his own will, before finally admitting in April 2016 that he was indeed abducted as long feared by friends and family. 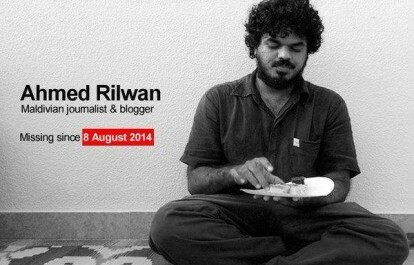 At the time, police revealed security camera footage that showed Rilwan was followed on the night he went missing. DNA evidence was found in a red car that was allegedly used to abduct him, police said. On Wednesday, the Maldives Independent reported that police had information about Rilwan being followed by suspects affiliated with criminal gangs as early as October 2014, two months after the abduction. It took two years for police to disclose the information they had about the crime and evidence that was reported by the media as early as August 23, 2014. By then, the suspects had been allowed to leave the country. Suspects were arrested and released. They were put on no-fly lists by the Criminal Court, but families of some suspects claim that they left the country years ago. The ruling party-controlled parliament threw out a petition signed by more than 5,000 people urging politicians to seek answers. That the investigation failed to follow basic procedure and crucial leads is now an irrefutable fact established by the Maldives Criminal Court. A knife that was found at the scene of the abduction went missing from the police lockup, basic analysis on video evidence was never done, eyewitnesses were not shown photo line-ups to eliminate suspects or confirm the identity of who was abducted, chain of custody documents for crucial pieces of evidence was not submitted to the court and the prosecution even failed to submit the ownership registry of the red car alleged to have been used in the abduction. If President Yameen is at all sincere in his apology for the “Rilwan is dead” remark, he is in the perfect position to prove it. He has the power to launch inquiries into police and prosecutorial negligence and to force fresh probes to find out what really happened to Rilwan. Today marks the fourth year since the abduction, 1460 days too many – days of anguish and heartache for Rilwan’s family, who suffer without closure, without any notion as to what happened to him. At all levels — the executive, the parliament, the judiciary and independent watchdogs — the Maldivian state has been derelict in its duty for four years. The state’s complicity in the abduction and cover-up is glaringly obvious. This is an affront to all of us. Today, the Maldives stands disgraced. Mohamed Junayd is a journalist with the Maldives Independent and the Maldives correspondent for Reporters Without Borders.